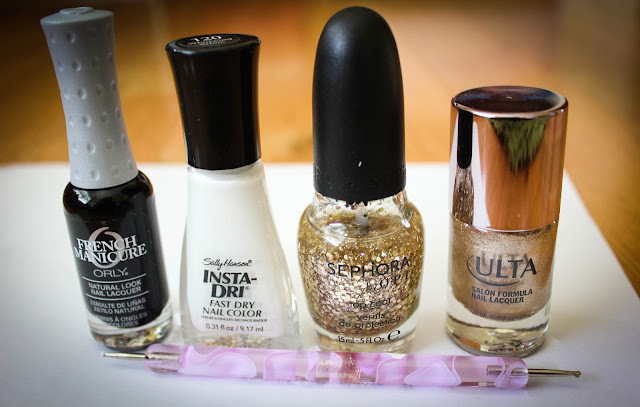 Step 4: Starting with the thumb - use a gold polish of your choice (I used "High Roller" by Ulta) and carefully paint on a French Manicure tip. Step 5: For the index finger - paint on two coats of white polish, leaving a U-Shape sliver of black peeking through (I used "Whirlwind White" by Sally Handsen). Step 6: For the index finger - After the white dries, use a dotting tool (or a toothpick if you don't have a dotting tool) and create your polka dots! To make life easier, I would suggest dripping some polish on a piece of paper instead of using polish from the brush. Step 7: For the middle finger - use your dotting tool to mark the v-shape point and the tip of your heart. Then outline the heart with your dotting tool and fill it in carefully with the brush. Step 8: For the ring finger - Use Sephora by OPI's "Only Gold For Me" Top Coat and glitter it up until you're happy! 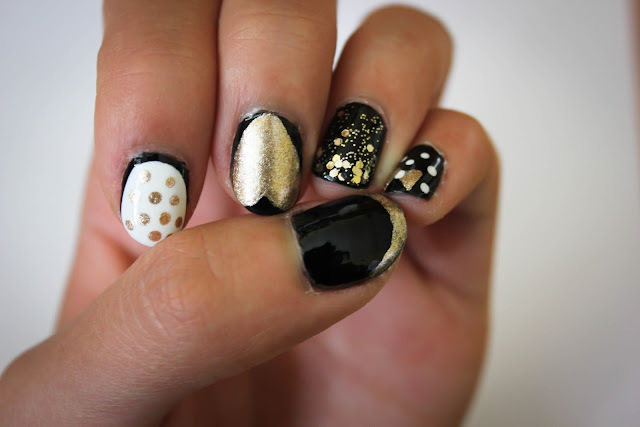 Step 9: For the pinky - using your gold polish again, dot the middle and corner of your bow, and fill it in still using your dotting tool. 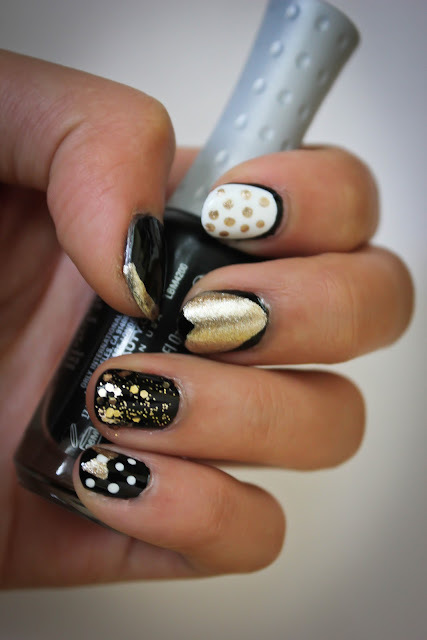 With a dot of white polish, accent the middle of the bow and finish by adding some more white polka dots around it. Tip: I also like to put the bow at a slight angle to make it just a little cuter! And if you're interested, on my other hand I swapped the design between my middle and index finger, did a french tip on my pinky, the bow design on my ring finger, and glittered up my thumb. Hope you like this look cause I know I can't stop staring at my nails :) And for everyone on the eastern sea board, I hope you're all safe and sound!! Love you all!